In a few short days the Olympics will descend upon the Earth, and with it will come hundreds of stories of triumph and failure that you need to be able to watch—or at least talk about the next day. Your best friend is about to turn into an ice skating expert, and your brother is going to painstakingly explain the rules of luging to you. The weird winter sports are upon us, and unless you want to spend your days glued to sites like Deadspin, eagerly waiting for the next clip of a guy taking a set of skis to the nards, you’ll need a way of watching these events. So here’s a guide on how to watch the 2018 Winter Olympics. I’ve split it up into the different forms of viewing—from live to time delay to on-demand. Remember that this year the Olympics are in PyeongChang, South Korea, which is 14 hours ahead of the Eastern Standard Time Zone (so 15 hours ahead of Central, and 17 hours ahead of Pacific). If you don’t live in one of those time zones you can see how far ahead (or behind) PyeongChang is by checking this website, or you can add this Google calendar, which will tell you when every event is taking place. If you’re one of the millions of cable and satellite subscribers in the US, you have the easiest method of watching the Games this year. NBC holds the exclusive rights to broadcasting the Olympics in the US, and claims it will be live streaming 1,800 hours of Olympic winter sports over the two weeks of the Games. The streams will be in HD and available via NBCOlympics.com on your Edge, Safari, Chrome, or Firefox browser. If you prefer to watch the streams on your TV, phone or tablet you can do so via the NBC Sports app available from the iTunes App Store, Google Play, Windows Store, Roku Channel Store, Apple TV, Amazon Fire, Comcast X1, or Samsung TV. The only thing required, besides solid internet, is the login for your cable, satellite, or telco subscription so you can prove to NBC you pay your carrier fees. If you’d prefer to watch the games the old-fashioned way, with NBC curating them and deciding what events are and are not worth your time, then you can catch the (almost) 24/7 broadcasts available on NBC, CNBC, NBCSN, USA, and the Olympics Channel. If you are me circa 1996 and are lacking high-speed internet and cable, but you do have access to broadcast television, then you can catch the most popular events by tuning into NBC’s broadcast. You’ll need a good antenna, and your TV will need to have a digital tuner built in (check the manual to confirm). To assure that your house can even receive NBC over the air, check out the TVFool and punch in your address. The website will not only show you what channels are available in your specific location, it will also tell you which way to point that antenna to ensure the best reception for a particular channel. Respect to you, my card-carrying cord cutter. You’ve survived this long without sucking at the teat of big ISP. But unfortunately, due to NBC’s stranglehold on the games in the US, your options for watching the Olympics are limited. Your first choice is to watch what NBC airs on its local broadcast. Your second choice is to watch the streams available online; however, you’ll only get to watch 30 minutes before NBC requests you log in via your cable, satellite, or telco provider, so plan accordingly. Your third option is to hunt for illegal streams on YouTube, Facebook, or Twitch—but be advised that NBC protects its broadcast rights in the US with almost unusual zeal, and there’s no guarantee a stream will last through an entire event, let alone the whole two weeks of the games. If you want to guarantee you’ll have access to all the events you want to watch, your best option might be to get a Hulu Live TV subscription for the duration of the Games. In fact, Hulu Live TV might be the best way to watch the Olympics, period. If you’ve never subscribed before, a two-week trial is free and should cover you for the entire 2018 Olympics. If you have subscribed before, you’ll need to pony up at least $40 for the monthly subscription. Hulu worked with NBC and the Olympics to create its experience, which allows you to subscribe to specific sporting events. (For example, lovers of curling can get that weird thing and only that weird thing.) You can watch them live, or DVR them automatically, and you can also watch short clips, for when someone inevitably performs some heartbreakingly triumphant feat of human spirit and everyone at work won’t stop talking about it. Hulu gave Gizmodo a sneak peek at the layout, which will be exclusive to its app, and we were definitely impressed by the polish. The first aspect of it, where you choose your favorite sports, is live now. But remember, it costs cash, and if you aren’t already a Hulu subscriber, that might be a bridge too far. Subscribers of other live TV services, like YouTube TV, PlayStation Vue, and SlingTV won’t have as curated or customizable experience. Instead, you’ll need to stick with watching the games from the five available broadcast stations (your online TV login for these services, sadly, does not work with NBC’s live streaming solutions). Look, we all hit hard times, and not everyone can afford $40 for a Hulu subscription or $60 for cable—at minimum. Unfortunately, NBC really does not care if you don’t have the money because its entire function on this earth is to make money. So if you’ve got no money and really, really want to watch the Olympics, you’re going to have to get crafty. One possibility is to use a premium virtual private network (VPN), connect to a UK server to give you a UK IP address, and access the BBC stream through TVPlayer.com. As TechRadar points out, BBC won’t stream everything, but you can the Eurosport channel for less than $10. Add in a VPN subscription (the free versions are not always reliable), and you’re looking at less than $20 for the full two weeks of the Games. Another option is to check in with your local bars to see what events they’ll be tuning to and when. 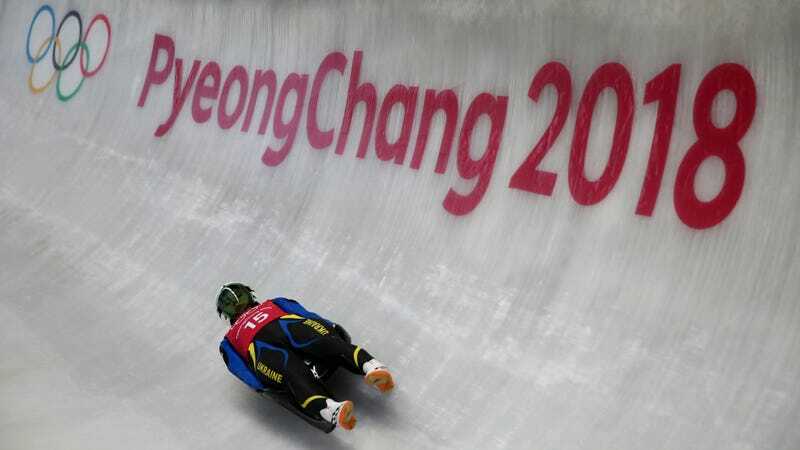 NBC and its affiliates will also post the coolest clips online, so you’ll be able to at least get a taste of what’s happening—and remember, you can still watch NBCOlympics.com for 30 minutes before it demands an authentication. If you don’t mind wading into a gray area that definitely violates someone’s terms of service, you can try bugging a family member for their cable login like you usually do for HBO and Netflix. That will give you instant access to the best version of the Olympics without the 30-minute time limit. If you’re friends and family are as broke as you are, a VPN is too much of a pain, and standing outside a bar looking in on the happy paying customers just won’t fly, then you’ll have to resort to looking for those less than legal streams online. But again, remember, there is no guarantee on how long those streams will last. And if they’re not on a regular streaming website like Twitch (where they are a violation of the terms of service and will be quickly killed), then you may open yourself up to malware and viruses. So practice safe browsing techniques and don’t click on anything that looks big, shiny, and clickable—it’s probably something nasty. And if all else fails, head to Twitter. Someone will absolutely be live tweeting the event you love as it happens.